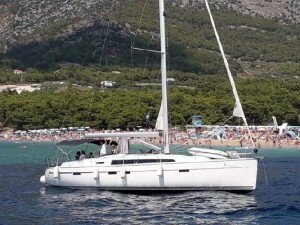 This Bavaria 46 Cruiser is presented in excellent condition, having been sailed for two seasons and meticulously maintained, she is equipped and ready to set sail with her new owners. This Bavaria 46 Cruiser is powered by a Volvo 55hp diesel engine, with 1200 engine hours. Additional mechanical equipment onboard includes 18000BTU air conditioning and 4kw diesel heating. This Bavaria 46 Cruiser is rigged with an in-mast furling main sail and a roller furling genoa. Accommodation for up to 10 guests is provided on board this Bavaria 46 Cruiser. This Bavaria 46 Cruiser offers a convertible bow cabin for a 3 or 4 cabin setup. The central wall is easily removed to split the bow cabin into two double cabins. Aft are two further double cabins with each with a double berth, storage cupboards and an ensuite bathroom. The saloon seating on this Bavaria 46 Cruiser can be converted into a further double berth for additional guests if required. This Bavaria 46 Cruiser is equipped with 300W solar panels and Raymarine navigation equipment.